Not far from the Municipio Square you can find the Church of San Francesco with the Ancient convent that became the Municipal Headquarters. The Franciscan convent was founded in 1646. In the church of San Francesco, built a few years later, one can admire the works of several artists, such as Calise, Ceppaloni, Schiano, Bordoni priests and various sculptors. Filippo Baldi’s frescos depict the Saint Francesco’s life in the cloister. The Saint Francesco church façade, is curiously blank, having only a stone entrance with a rectangular window above and access is directly from the Piazza Municipio, without the formality of steps to the entrance. 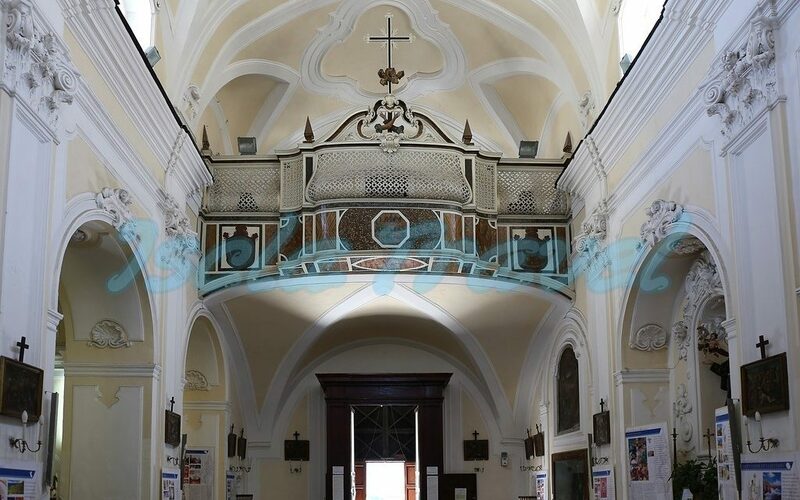 The Church is built of tufa stone and white stucco, the interior is richly decorated, with the Corinthian order and round headed arches, with chapels on the south side. It also has beautiful old ceramic floor tiles. Its clerestory windows illuminate the interior and at the eastern end a large curving window filled with modern stain glass will grab your attention for a while. The most important paintings of this church are: ‘Stations of the Cross’ by an unknown 18th c artist, ‘The Madonna giving the Rule to S. Francis’ signed by Giuseppe Simonelli, paintings by Carlo Ferrazzano (1778) that represent ‘The Nativity’ and ‘The Birth of S. Francis’, ‘Pieta’ by Mattia Preti of Naples. On the north side of the church there is a large 16th century painting on panel of ‘The Immaculate Conception’ by Marco Pino. Do you want to visit "The Church of St. Francis Assisi" during your holidays in Ischia?